Merry Xmas and have a Happy New Year 2019 everyone! 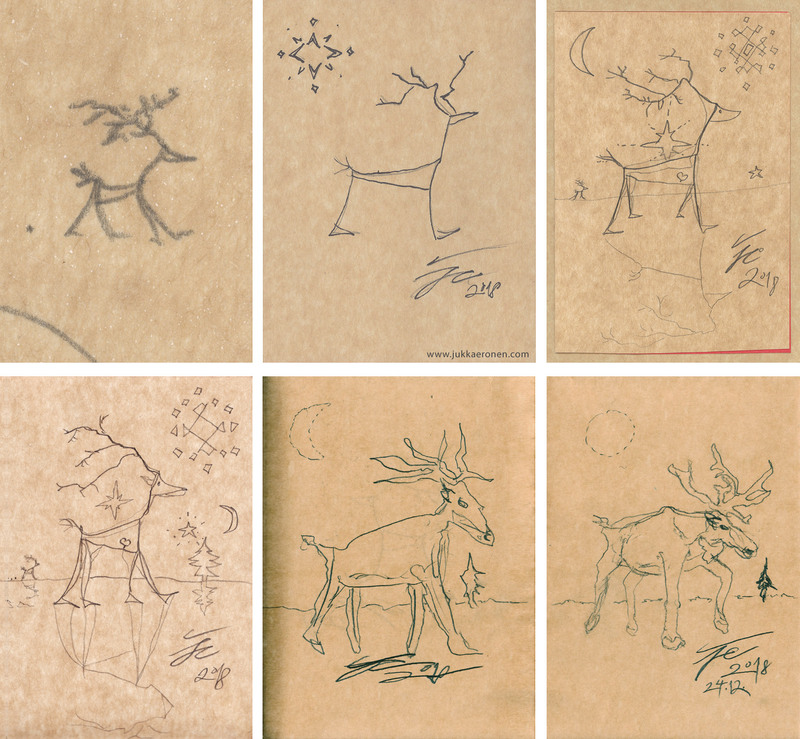 This comic is called Reindeer Evolution (2018). Narcosis the Cat comic strips #54 (2010) and #86 (2010-17). Inspired by the modern day digital printing errors of various kind, 1980s computer games with their low-resolution pixel style, and classic comic strip rasters. See here for all the comics strips on the blog. 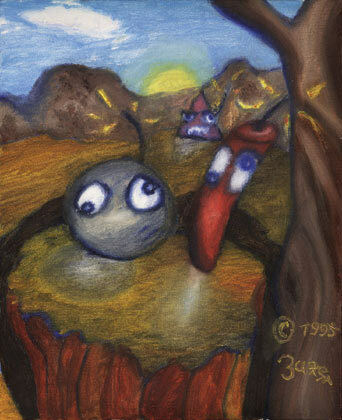 Apokryfia is my poetic series of graphic novels and comic strips. 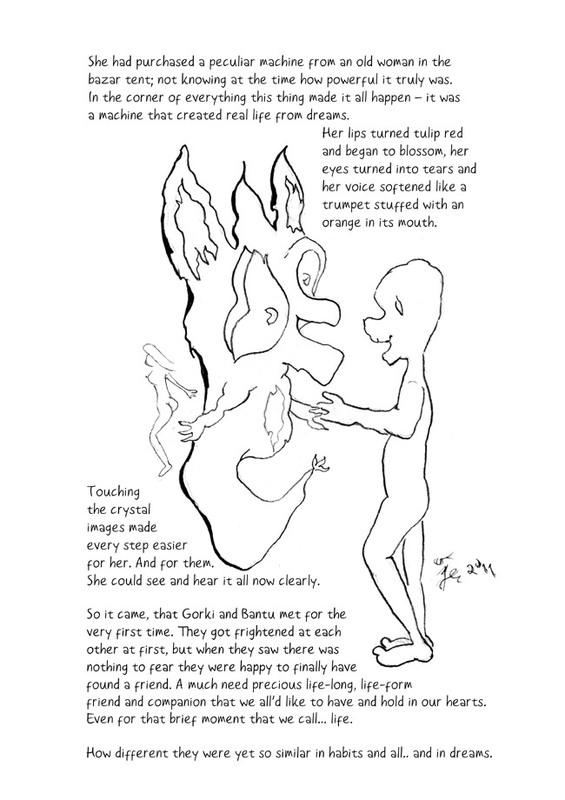 Graphic poems, if you will. 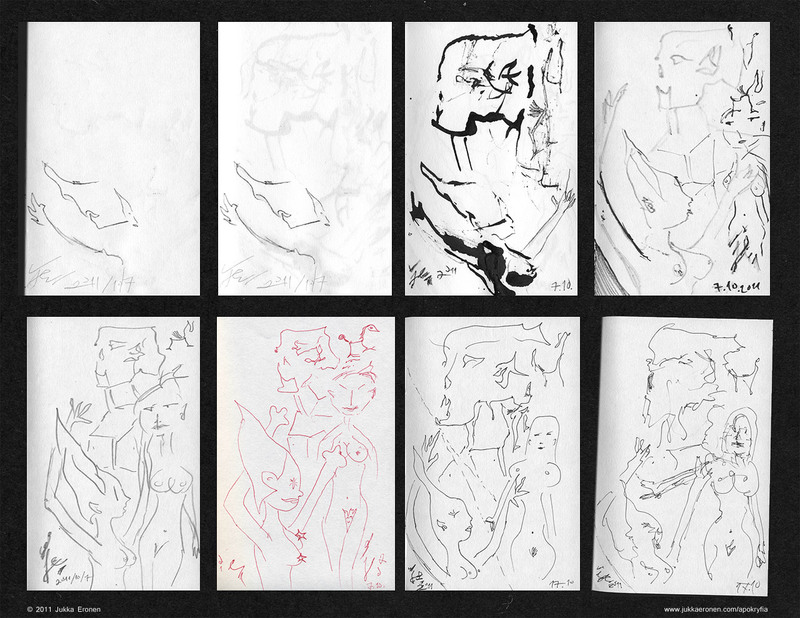 The illustrations, visions and ideas often start from my sketch books that I’ve had as visual diaries since 2009. I usually carry the newest book with me wherever I go in case of wanting to draw an idea down. The story of Apokryfia – Venus and the Dream Machine: it all began with a singular dot. 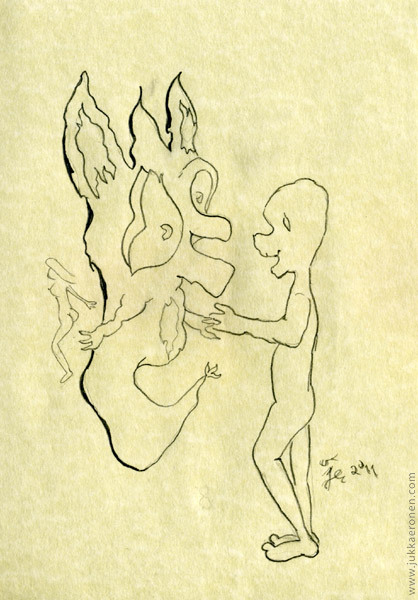 In 2011 I decided to make a metamorphing or animating drawings out of sketch book #6 (Zeta). I wanted to see out of curiosity what kind of visions would happen along the way from such small beginnings. 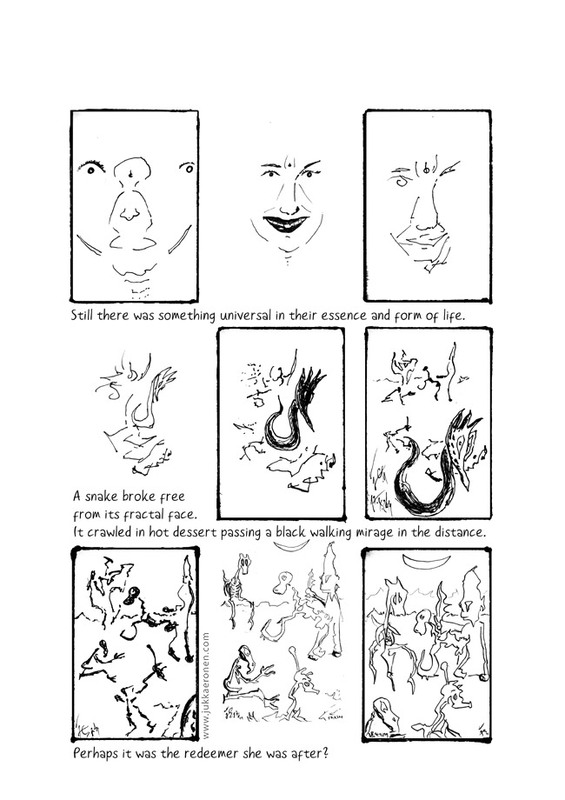 Meaning, in the 110 pages the images slowly transform and animate into the next image. Happenings and characters appear and disappear. It starts and ends with a dot. Here is the final 8 page result as of 2017 when I drew and constructed the final graphic novel / comic strip. This was the core of it but there is additional left-over material that I might publish some day too. Especially if I hear interest from You, dear readers. Everything you’re about to see and read is from my imagination without outer stimulants. Everything was improvised. (Except for the final color image that was partially inspired by the graphics of 1980s version of a Finnish cherished board game from the 1950s.) Now let us begin. Venus passed a busy market street full of beautiful fertile naked women. The images of strange beings in her mind merged with the memory of a girl from her youth. And all the animals she had always loved. 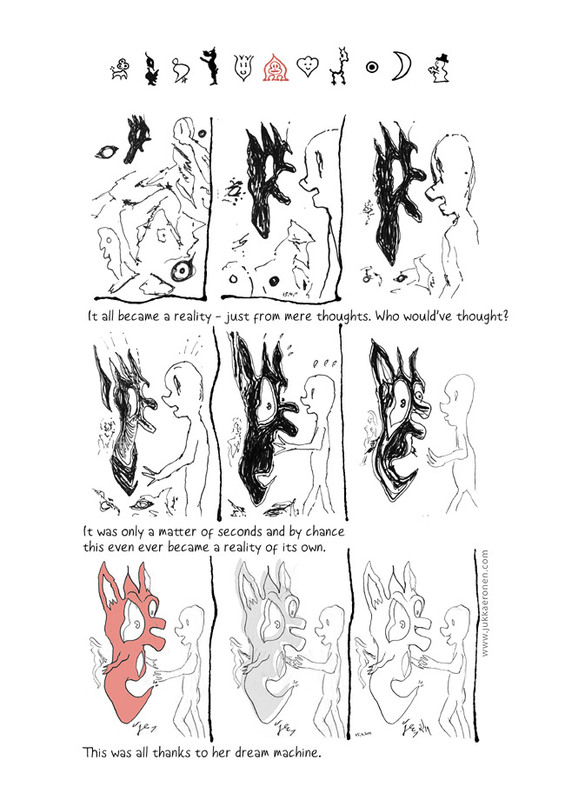 It all became a reality – just from mere thoughts. Who would’ve thought? It was only a matter of seconds and by chance this even ever became a reality of its own. This was all thanks to her dream machine. She had purchased a peculiar machine from an old woman in a bazar tent; not knowing at the time how powerful it truly was. In the corner of everything this thing made it all happen – it was a machine that created real life from dreams. with an orange in its mouth. Touching the crystal images made every step easier for her. And for them. She could see and hear it all now clearly. So it came, that Gorki and Bantu met for the very first time. They got frightened at each other at first, but when they saw there was nothing to fear they were happy to finally have found a friend. A much needed precious life form companion — a lasting friend that we all would like to have and hold in our hearts. Even for that brief moment that we call… life. How different they were in appearance yet so similar in habits and everything else… and in dreams. They shared a mixed combination of all the good qualities that beings can have; supporting the other where the other was lacking in. The encounter was brief yet joyous and full of excitement. It had been the most important handshake of their curious lives. Now it was time to move on – and to let the tiny Venus find her way too. Still there was something universal in their essence and form of life. A snake broke free from its fractal face. It crawled in hot dessert passing a black mirage walking by in the distance. Perhaps the image belonged to a redeemer she was after? Unfortunately it turned out to be something much more sinister. It was a Slave Dealer in the land of the dead. Surrounded by poor fragile skeleton souls, a skeletal giraffe and their Dark Dealer master in between, a mysterious sign in the mountains gave her the last and only gleam of hope of ever finding peace. 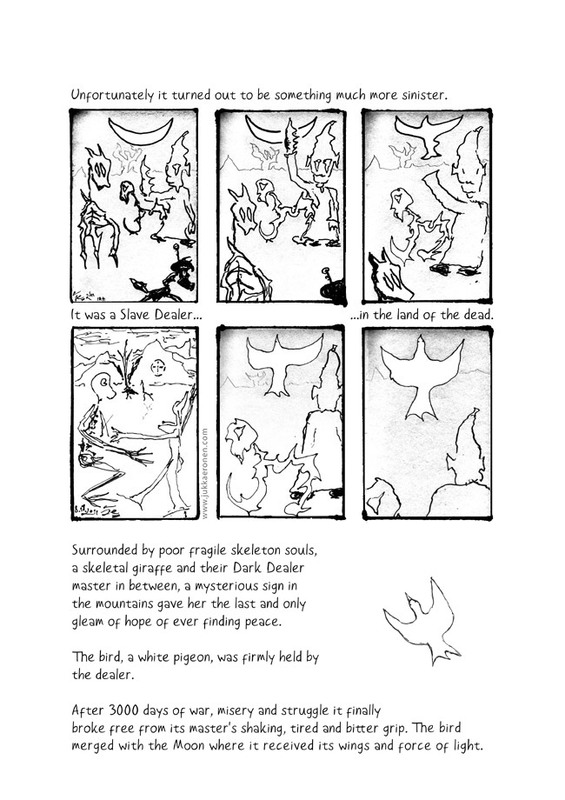 The bird, a white pigeon, was firmly held by the dealer. After 3000 days of war, misery and struggle it finally broke free from its master’s shaking, tired and bitter grip. The bird merged with the Moon where it received its wings and force of light. The pigeon guided Venus from this day onward – till the rest of her days. 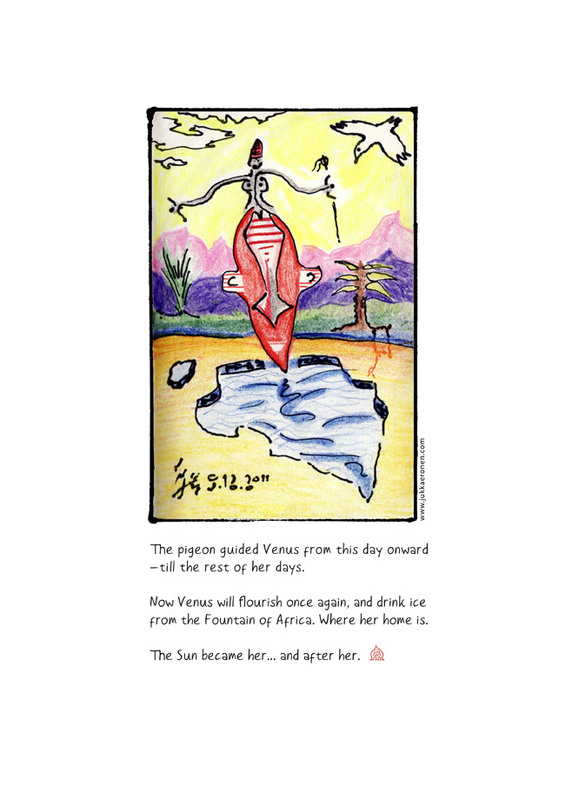 Now Venus will flourish once again and drink ice from the fountain of Africa. The Sun became her… and after her. Happy Valentine’s Day everyone! 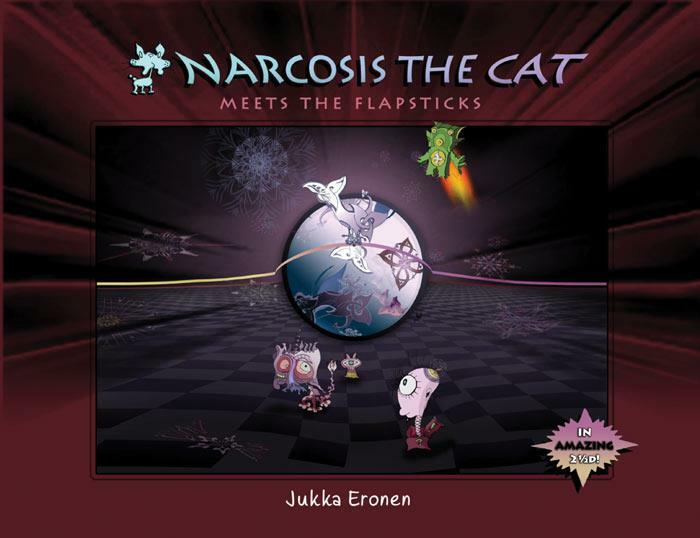 <3 This is from the comic strips of Narcosis the Cat Meets the Flapsticks. 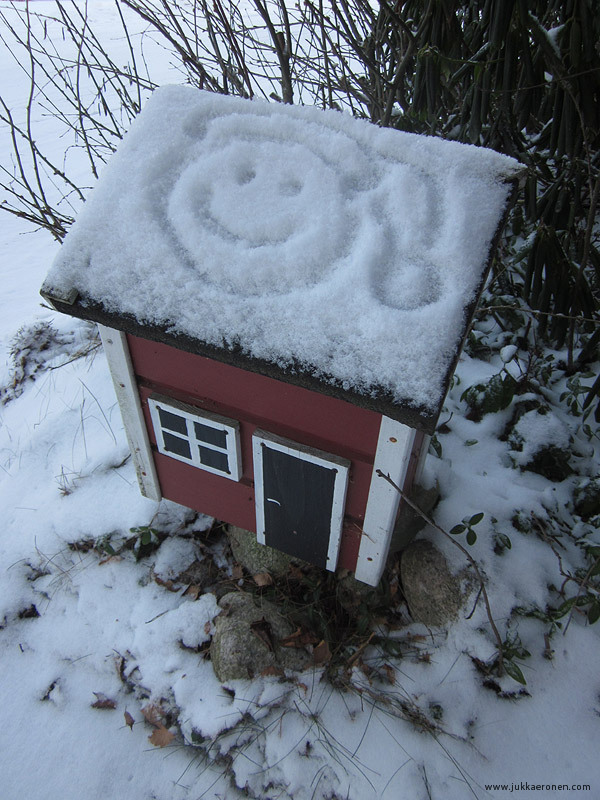 Having made their first appearances in the Apokryfia books, main characters of the wordless Symbol Land comic strips, sketches and artwork are Man ♂, Woman ♀ and Tri-Heart ♥. Also known as Mars, Venus and Love. 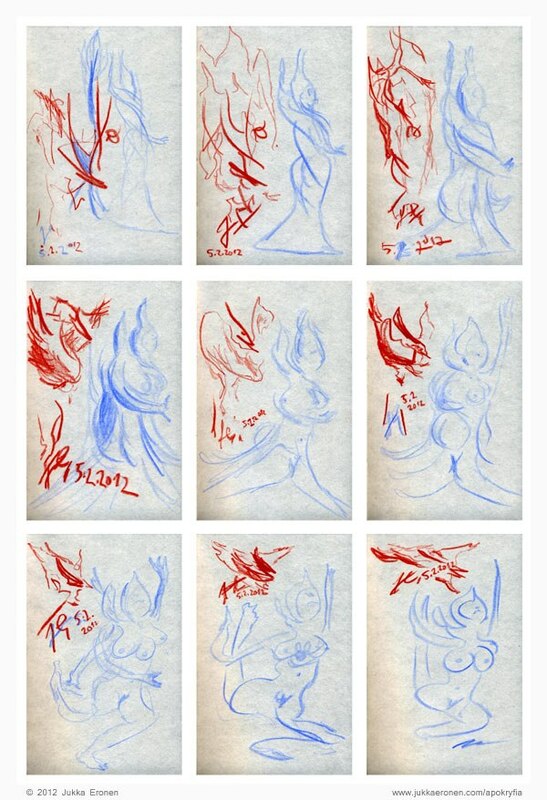 9 panel series sketch art Dancer (2011) from the Apokryfia book #8 Theta. Pencil, 10×15 cm *9. Featuring two changing women, a skeleton head in the background and a shape-shifting generic animal – one of my reoccurring motifs. 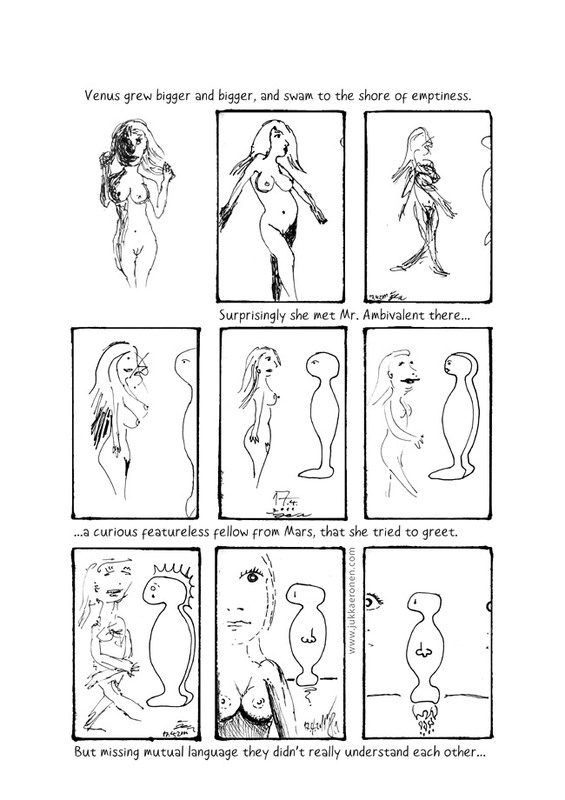 Woman (Venus ♀) of Symbol Land makes a metamorphic appearance in the 6th panel. From the Apokryfia sketch book #12 Mu (2012). 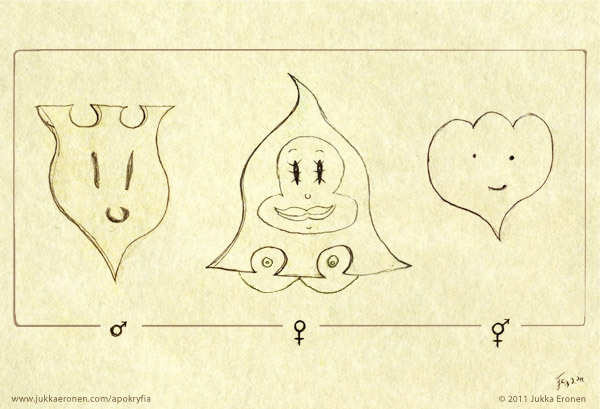 Featuring Symbol Land characters Man ♂ and Woman ♀ – or Mars and Venus. Pencil, 10×15 cm * 3. In a million years you never can guess what happens next in the wacky adventures of Explosion Land, part of the Flapsticks‘ comic book worlds. Now how’s that for a mind-blowing twist-ending. That’s all folks this time, see you soon! This Sunday strip in color – and in Finnish. 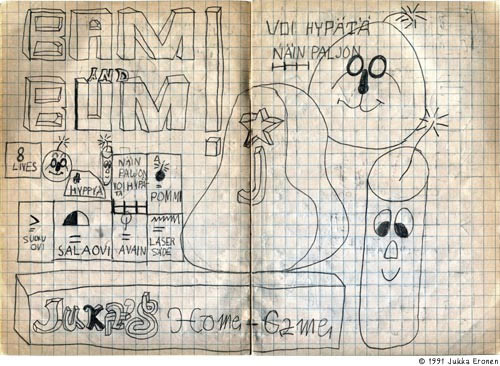 Early 1990s Bam and Bum – a.k.a. Bum and Pow from 1995 onward. Bum and Pow – an antropomorphic bomb and a dynamite – are my oldest comic book characters still in use, from 1991. 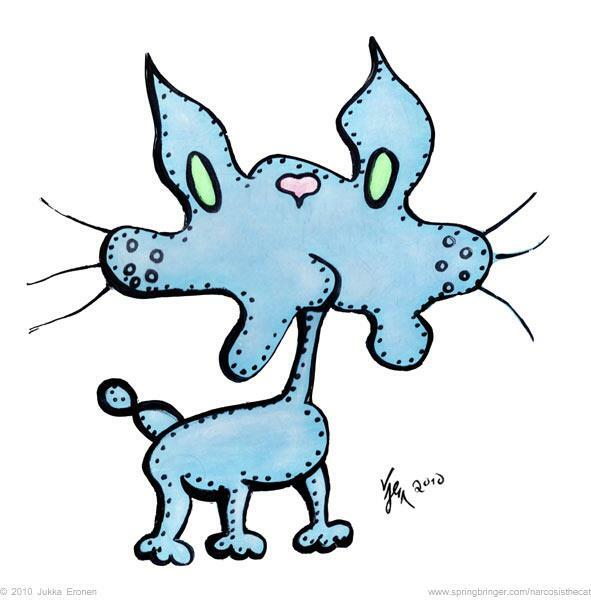 They are nowadays part of the Narcosis the Cat Meets the Flapsticks -comic book world that I began to re-discover and investigate in 2007 from my 1997–1999 mathematics and physics book doodles and illustrations. I noticed that some of the characters, beings and things had obviously escaped from the same universe so I started to investigate these little critters, their peculiar habits and their world in a more accurate way. 1st Explosion Land strip from 2010. Another usual day in Explosion Land. In summer 1995 my grand mother Tellervo taught me to paint with oil colors. 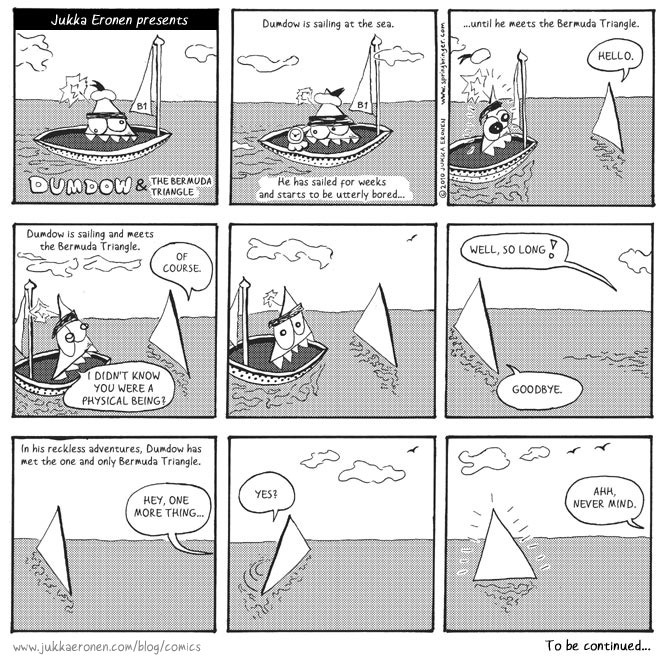 I chose my comic book characters Bum and Pow and Dumdow the Angry Triangle as my first motif. Also notice the surrealistic white shadows. The painting was called Tight Spot (1995) which was also the name for a puzzle/platform computer game I was planning to code on Turbo Pascal. I’ve coded countless of hours with it and even today it’s the programming language I know and do the best. I scanned the oil painting as the title screen and made sprites, animations, logos and music but unfortunately the game was never finished. There are f.ex. animated rolling VHS tapes, cassettes, CDs, disks and other nowadays defunct but collectible electronic media you were supposed to collect in the game (by the way in reality I collect 1980s ex-rental video cassettes and old computer games). This was one of my pet projects and I still hope to do something with the concept some day. Stay tuned for more Explosion Land comic strips next time! Olen piirtänyt ja luonut sarjakuvahahmoja pienestä pitäen. Olen löytänyt niitä myös mm. näkemällä niitä luonnon muovaamissa muodostelmissa ja fraktaalimaisissa kuvioissa. Räjähdysmaan asukit Bum-pommi ja Pow-dynamiitti ovat pitkäikäisimmät edelleen käytössä olevat hahmoni vuodelta 1991 (tuolloin nimillä Bam ja Bum). Minulla oli myös näihin hahmoihin pohjaava puzzle-tietokonepeli Tight Spot tekeillä vuonna 1996, mutta se jäi kesken. Nykyään nämä räjähdysherkät sankarit esiintyvät Narkoosi-kissa & Fläpstikkaat -sarjakuvien tarinoissa omassa maailmassaan. Man or the Egg #1 – #3 (2012–13). Drawn with pencil and digitally colored. Narcosis the Cat cardboard cut-out (2010) painted on acrylics. which are currently in Finnish, translations are coming. 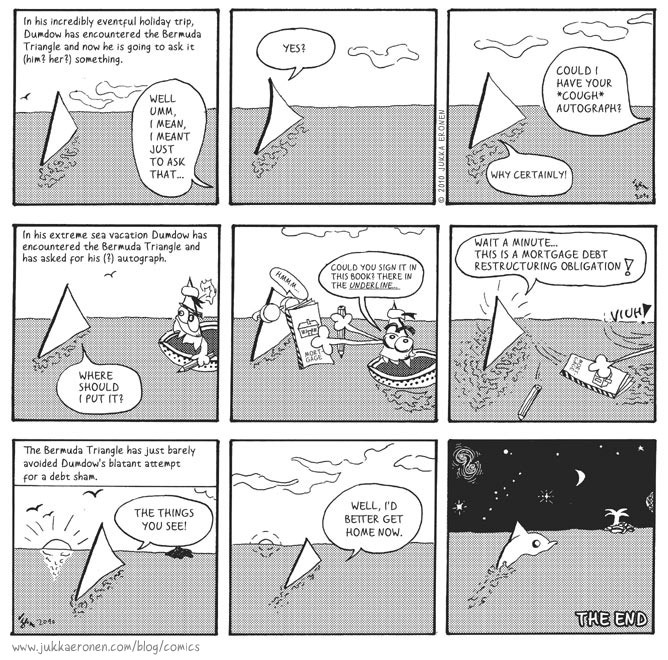 The blog will also feature English strips every now and then: here are all the strips currently available. A 9 frame graphic novel Winter Princess (5.2.2012). Wooden color pencils, 10×15 cm * 9. From the Apokryfia sketch books.